Q: Can I design the pool to save on maintenance costs and time spent on maintenance in the future? A: Features like in-floor cleaning systems and variable speed pumps will absolutely save time and costs in the future. A self-cleaning pool or a pool with an in-floor circulating system, will not only be cleaner but it will filter better, circulate chemicals better, and reduce costs associated with both. Q: Why would I want the “cleaning system”? Q: What is the best type of inground pool? A: If you ask a swimming pool engineer, the unanimous answer will be that an inground gunite pool or in-ground shotcrete pool (synonymous terms) are the best types of inground pools. Gunite is durable and highly customizable. Gunite is also the type of inground pool you will find almost exclusively at commercial locations like hotels, campgrounds and country clubs. Gunite pools are engineered to withstand harsh New England winters and other vicissitudes of nature. There is a misconception (not everything on the internet is true!) that gunite pools are a better choice for homeowners in the South. That is simply not true. No matter where it is located, a properly engineered inground gunite pool will stand up over time better than any other type of inground pool. A liner pool is nothing more than an above-ground pool put in the ground with some additional supports to hold up the walls; a fiberglass pool is no different than a fiberglass bathtub, just larger. If the winter frost can damage a gunite pool (as the “competition” states), that same frost will surely damage a fiberglass or vinyl wall. A gunite pool is engineered to have tensile strength, not compressive strength, which means it will flex as required, and due to the thickness of the gunite we install, along with the rebar we use, you will end up with the best quality pool possible. Q: How much does a gunite pool cost? A: The cost of installing an inground gunite pool is as variable as the cost of a house. A basic, freeform (kidney or similar shaped) inground gunite pool will start in the low $30,000 range. Once the final shape and size has been determined, we calculate the price of our gunite pools based upon the area and the perimeter of the pool. Quite often there are some features that are “required” by the owner and the cost of these is added to the basic pool package (features like pebble interior finishes, attached spa, custom masonry stonework, etc.). Our highly trained in-house pool designers then educate the buyers as to what other features are available, what benefits those features offer, and what the newest and best technology available is. We allow the buyer to custom design their inground gunite pool so that it meets their needs and their budget. When comparing the cost of an inground gunite pool to that of a liner or fiberglass pool, one must make an apples-to-apples comparison. If we design a gunite pool with the exact same dimensions and features as a comparable high-quality liner or fiberglass pool, our inground gunite pool will be anywhere from ten percent to twenty percent more. A gunite pool will not cost significantly more when features are comparable and, even more important, the additional cost is recouped over time, as a gunite pool is less expensive to maintain. Aqua Pool’s à la carte menu allows you to pick and choose which features are the most important to you, eliminate features that are less important or that can easily be added later, and create the custom backyard dream pool you deserve. The best quality pool is a gunite pool. Most homeowners who do their homework and get the facts will understand and appreciate the value and strength of a gunite pool and why we can say without hesitation that it is the best quality pool on the market. Q: How is gunite applied? A: Gunite is a sprayed cement process conveyed pneumatically through a hose at high velocity onto a receiving surface. What this means is that it’s cement sprayed through a hose similar to a fire hose. The cement is a mixture of aggregate (sand, gravel, etc.) and paste (Portland cement). The highest quality pools built are gunite as they are engineered to withstand the movement of the earth due to the strength of the gunite, the strength of the rebar skeleton over which we spray the gunite, and the tensile strength of the structure. Once the gunite is sprayed in place, minimum cure time is seven to ten days during which the homeowner is required to “water down” the structure to aid it in curing properly. After this time, construction procedures, like tile and coping or interior finishes, can be applied. Q: Are gunite and plaster the same thing? A: No! A gunite pool indicates the underlying STRUCTURE. Plaster is the final FINISH on top of the gunite structure. All inground gunite pools have the same structure (gunite or dry shotcrete – synonymous terms). The final stage of construction entails applying an interior finish, such as plaster. Plaster is also called marcite or merbelite. It is one of many types of interior finishes available for a gunite pool. Just like one can have a painted house, vinyl siding or clapboard, one can have a custom gunite inground pool with different interior finish options. For more information about gunite pools, click here, or contact us today! Q: Do I need a professional landscaper to get started on building a pool? A: No. Quite often the project will take more than one season to “evolve”. Start with the pool designer and then decide what is most important for you and your family. We have built many many pools where there is no landscaping for the first year (in some cases several years). One can still use the pool without a patio or formal landscape plan and this would allow one to spread out costs over time. We all know how fast time goes. So, plan the pool to meet all your expectations. Like a business plan or a relationship: start with a strong foundation. Everything revolves around the pool and much of it cannot be changed later. If you must “wait a bit” for the fire pit or the outdoor kitchen (for example) to build the pool of your dreams, then do that. Over time the back yard can evolve into the works of art you see on the web site. Q: How do I choose things like the interior finish of my pool? A: Near our office, we have more than a dozen homeowners who allow us to show their pools to potential clients. We call this our “Pool Tour”. We can show potential customers (or current customers whose pools are already in the process of being built) many different pools to assists in the decision-making process. We can show older pools, newer pools, freeform, geometric, dark finished pools, light colored pools, water features, raised spas, and all kinds of backyard designs. In the process of the pool tour we can show the quality of our craftsmanship and aid the new pool owners in making decisions like which interior finish best suits their needs and desires. Speak with a pool designer to schedule a tour. Q: After the pool is built, what services are included? A: Once there is water in the pool, our Service Department will visit to initiate the pumps, program the system and get the pool up and running. We will then have a scheduled “Pool School” with the new owners to go over everything on the new pool. There is a lot to absorb so we then have 4 additional maintenance visits included with our new pools. The service tech who visits over the next 4 weeks is available to answer any/all questions (and if they do not know the answer they will find out!) so that by the time we get to the second month of ownership, most of our clients are well prepared to take over maintaining the pool. We are ALWAYS available for questions and concerns (there is an on-call technician 7 days per week until 8:00 P.M.). Q: Are service technicians available 7 days per week? A: Yes. We have service technicians on the road minimum 6 days per week and have an on-call technician available for technical support 7 days per week until 8:00 P.M. In the rare instances where an emergency visit is required, the on-call technician is prepared to make the service call for a fee. Most times all it takes is a phone call from one of our qualified technicians to assist. Call our service department at 860-623-8374 and ask for the on-call technician to call you back as soon as possible. Q: Does a gunite pool need to be acid washed regularly? A: NO! ABSOLUTELY NOT! There is a misconception (the internet is filled with un-truths) that gunite pools MUST be drained and “acid washed” regularly. This is a good way to “sell” service work or discourage people from buying a gunite pool (the less-than-honorable liner and fiberglass pool builders use this to sell “against” us). But it is FALSE. One need not ever drain a gunite pool unless there is an issue or if one desires to have the interior cleaned. We have pools built in the 70’s that have never been drained and never acid washed! If, after several/many years, one would like to have the pool interior surface cleaned and make it look its best, a good way to do that is with a light acid wash performed by licensed and qualified (and OSHA approved) service technicians. But gunite pools do not “need” to be drained regularly. That is up to you. Q: Does the “liquid solar blanket” really work? A: Yes. It is not as efficient as an actual solar blanket but for those customers who have a pool design that does not lend itself to a solar cover, or for those that do not want to look at the solar real, the liquid solar blanket is a great alternative. Once added to the pool water it inhibits evaporation (which is also heat loss) which generally occurs at night. By having this vapor barrier floating on top of the pool water, the pool will retain some of the heat it gained during the day. Solar blankets are wonderful products but can inhibit usage (“I just wanted to take a quick swim but didn’t feel like taking off the cover and then re-installing it so I just didn’t swim), are not conducive to free form shaped pools (the covers come as a rectangle and get cut to fit the shape of the pool), and can be considered less than aesthetically pleasing (Does one really want to look at that reel every day?). The liquid solar blanket is a logical alternative and will not affect swimmers or dogs. Q: When do I add algaecide to my pool? A: Algaecide should be used as a preventative maintenance product (maintenance dosages) and usually is added the morning after the pool is shocked. It can be used for visible algae removal but once algae is visible it will likely need more aggressive treatment than a simple algaecide. Q: When should I shock my pool? A: Generally speaking, pool owners using chlorine based shock will shock the pool every other week EXCEPT in the “extreme” conditions: extreme heat, extreme rain and extreme bather load (like a big party). In these cases, shocking can become more frequent, maybe once a week. We try to teach our customers to pick a night (garbage night? Sunday night?) and get on a schedule. Shock should be added after the sun goes down (not necessarily at night but when the sun it not at its peak and not beating down on the pool) and then allow the pump to circulate the water over night or for at least a few hours after adding the chemical. For those customers who have an ozone system, shocking is less frequent. Q: How often should I get my water professionally tested? A: This should be done a week (or so) after the pool is opened (after the water can circulate a few days minimum and after the spring chemical treatments have done their job), then once a month over the season. The last professional test should be done about two weeks before the pool is closed for the winter so that the water is balanced during the months when the pool is not filtering. Q: Do I really need to get my pool water professionally tested? A: YES! Unless you have a very expensive (and elaborate) test kit and can analyze the effects each chemical addition has on the other chemicals, a professional pool water test is extremely important. Most pool supply stores will offer this service and the benefits from a professional water test will save you significant amounts of time and money! Regardless of the type of pool (gunite, liner, fiberglass), the pool water will “attack” the pool if the water is not balanced (alkalinity, calcium hardness, dissolved solids, etc.). The interior finish on a gunite pool the liner of a liner pool, and the fiberglass finish on a fiberglass pool will all last longer and look better if the water is balanced. Also note that the “expensive” chemicals like chlorine and bromine work better in a balanced pool which will also save you money and frustration. Q: What is the best filter for my pool? A: There is no “best” as each type has its benefits and liabilities. There are three types: sand, cartridge and diatomaceous earth (D.E.). All will do a fine job with keeping a pool clean. DE filters will remove debris down to the smallest micron, then cartridge, then sand. And one can add filter aids to assists in getting out the smaller debris. The most environmentally friendly one is cartridge as sand and DE use chemically treated and maybe heated pool water in the process of cleaning the filter (called backwash). Cleaning a DE or sand filter is quicker than with cartridge but it is the wasted pool water that is the main issue. DE filters have the dirty DE powder that must be addressed (a separation tank may be utilized or one will have dirty DE powder in the backwash area) and the sand in a sand filter must be replaced periodically (every 3 to 5 years) and is not something many homeowners are ready to do themselves. Aqua Pool uses mostly cartridge filters as they tend to filter better than sand, almost as good as DE, and do not have the issues of handling the dirty DE or wasting of pool water. Q: How often do I need to buy new cartridges for my cartridge filter? A: Like with answering how long should my filter cycles should be, this answer is dependent upon how the pool is maintained. Cartridges in a cartridge filter are paper and if they are taken care of (cleaned as needed, chemically soaked occasionally) they should give you years of service. On a new pool, the first year of usage is likely the most difficult for the filter as it will be filtering out the largest amount of debris (landscape debris, more dust than usual, etc.). Many customers have a spare set on hand but cartridges should last for several years. Q: Should I save some money and buy a 50-pound bucket of powdered shock? A: No. Powdered chlorine should be purchased in small, air sealed bags (or similar) so that each time one uses it, it is a “fresh” supply of chlorine. The large buckets seem economical when priced out “per pound” but each time one opens the large bucket of chlorine and gets a whiff of the chlorine gas, what we are smelling is the loss of the valuable chemical. Quite often by the time we get to the bottom of that bucket, there is very little chlorine left and all we are adding is binders and “chalk”. Purchase quality chemicals and it will pay off in the long run. Q: When I go on vacation do I shut the pool off? A: No, the pool should be allowed to filter every day so that we minimize the chances of al algae bloom. Depending upon the time of year (hours of sunlight, air and water temperature, air-borne debris) it may be as simple as setting the timer, asking a friend or neighbor to check the baskets a few times during the time away, and adding some sanitizer or oxidizer. Aqua Pool also offers Vacation Maintenance Service for our clients. Depending upon the time away, we set up a schedule so that a qualified technician watches the pool, adds chemicals as required, and cleans the pool so that our customers come home to a clean and inviting pool. Speak with a service manager to learn more about Vacation Babysitting for your pool. Q: Can the filtering equipment (pumps, filters, heater) be installed outdoors? A: Yes! All the main pool equipment manufacturers design their equipment for outdoor installation. There is no need for a “pool house” or “shed” in which to store the equipment. Try not to allow the bushes to overgrow the equipment (especially heaters) which will allow for moisture buildup and keep the mulch away from the vents on pumps and heaters. But overall, the equipment will operate maintenance free for years even if left out in the elements. Q: Can I use a heat pump to heat my pool AND spa? A: We believe the time it will take to heat a spa with a heat pump, especially in the northeast, is too long. Spa usage tends to be “impulsive” so when the desire arises (“Who wants to go in the spa?”). Aqua Pool believes the spa needs to heat up FAST! We recommend a large (400,000 btu) gas fired heater for the spa so that when you want, you can turn it on “on demand” and get in quickly. A heat pump will take hours (at best). Q: How often do I need to clean a cartridge filter? Q: Do I need a rectangular pool to do laps? A: No. All pools will have a “center line” so one can do laps in a freeform shaped pool just as easily as in a rectangular pool. Depending upon one’s preferences, the length and depth will likely be more important than the shape. If flip-turns are required than the lap depths at the ends will need to be deeper than normal. Avoid putting stairs in the lap lane as well. Most people do not need to do a flip turn on both ends so a standard pool with standard depths, as long as it is “long enough” to supply an adequate lap lane for the user, is just fine. Q: Can I have an umbrella put into the sun shelf? A: Yes. The installation of the anchor (a cup shaped piece that holds the umbrella) should occur during the construction process but an umbrella is a great way to protect oneself while enjoying the shallow water depths on the sun shelf. Q: What is a sun-shelf? A: A sun shelf, sometimes referred to as a Baja shelf or tanning ledge, is a “shallow” area in the pool where one can lounge, sun-bathe or sit in a chaise lounge chair. It is something that is part of the initial design as it can take up a fair-sized portion of the pool. The sun shelf allows one to be partially submerged and partially dry, ideal for sunbathing and playing with the kids (or dogs). The sun shelf adds some cost to the pool and will eat up some of the space but it is well worth considering on any pool. Q: Can I bring my patio furniture into the pool? A: Yes. Because we do not have a liner in the pool, a chaise lounge chair or similar may be used. This is especially enjoyable when there is a “sun-shelf” or similar. Be careful of metal chairs that could rust when in the water. Q: Do I need a ladder in my pool? A: No but you do need a way out of the deep end if it is 5 feet or deeper. Codes require a “means of egress” in the deep end and we usually build in a “swim out” or “love seat” to supply the users with their exit area. One could argue that a ladder generally has a “public pool” look so we do our best to avoid rails and ladders and instead build custom benches and stairs. Q: Do you build liner pools or fiberglass pools? A: No, we do not. We specialize in gunite pools only. We have more than enough knowledge and equipment to build any type pool but believe that we are the best at what we do and should not “spread ourselves thin” by offering anything and everything. Q: Will my homeowners insurance costs go up if I get a pool? A: There may be a surcharge (should not be “a lot”) but it very much depends upon your existing homeowners policy. We recommend that you contact your insurance provider. Q: Will my taxes go up if I get a pool? A: They may. You should speak to the officials in your town to get a more specific answer. Q: Does the spa make it harder to maintain the pool? A: No. During normal operation (every day, even when the pool is not used) the spa will filter WITH the pool (it overflows into the pool) so in effect the owners are taking care of “pool water” and not “hot” spa water (it is much more difficult to treat and maintain “hot” water). Because the spa is heated only on-demand, we are treating the pool/spa combo as if it is a pool only. After the spa is used, the valves go “back to normal” and the pool/spa go back to filtering as one body of water. It is by far the best way to plumb a pool/spa system. Q: Can my spa be kept open all year? A: Yes if it is designed that way. Most of our customers use the pool and spa for the months of April through October (quite a few from March through Thanksgiving). Some open them earlier and keep them open later. To keep it open all year, it is our opinion that the plumbing pipes should be placed deeper in the earth (below the frost line) and the pool filtering and heating equipment should be installed indoors. These are precautions for the frigid winter temperatures (moving water will not freeze) and the potential for power outages, etc. Most people find that the “idea” of using the spa in the middle of winter is more attractive than actually going out into the yard in the middle of the winter. So the system usually gets shut down and it gives our clients something to look forward to for spring. Q: What is a typical pool season? A: Most of our clients open the pool in April and close them in October. With a pool and spa combination, the spa will be heated up, on-demand only, in the colder months and then people will use the pool when they “warm up”. Our customers open the pool because they want the beauty of the pool AND the option of using it. Even if you only go “out to the pool” for the fire pit or to enjoy the sound of the water, it means you have used the pool! Q: How long does it take to build a pool? A: Depending upon the scope of the project it can be very quick or it can take a long time. It all depends upon how complicated the project is or if we are delayed due to others working in the yard at the same time. A typical pool takes 6 to 8 weeks to build. However, we have built them faster. It all depends on the project. Q: If the dog swims in the pool will it ruin the filter? A: No. A dogs hair may cause the need to clean the filter more frequently but it will not cause any damage. Dogs skin and hair tends to be more oily (and bountiful!) than a humans so if the dog swims a lot you may need to adjust your chemical usage. Q: Can my dog swim in the pool? A: Yes. Your pets are welcome to swim in the pool. We do not have liners on our pools so no need to worry about the dogs nails. We have built pools for families where the dogs usage was an integral part of the design. Invite the dogs in for a swim! You want to teach the dogs where the stairs are just as you would a child, but absolutely, let the dogs use the pool! Q: Who owns Aqua Pool? A: Aqua Pool is owned by Ron Giannamore (father) and Michael Giannamore (son). See the “About Us” page to learn more about our history. Q: Can I use flexible PVC for the pool suction and plumbing lines? A: NO! The only place one should use flexible PVC would be in the spa walls for the spa jets. We do not use flexible PVC in the ground, ever. Q: Can I take care of my pool myself? A: Yes, for the "DIYers" you can take care of your own pool. Many of our customers do it all except winterize or open the pool in the spring. They allow the professionals (licensed) service technicians handle those two processes and they take care of the pool during the season. It is not a lot of work nor do you need to be a lab technician or a chemical engineer! Q: Are pool slides expensive? A: Everything is relative, so it is hard to answer. Slides are meant to be slippery and in a normal installation are 6 or 8 feet above a cement patio so we do not install a lot of “standard” slides. The slides we are requested to build are mostly the built-in type and those can be considered a costly feature, due to the labor and materials required to build them. The slide is a feature like any other and may be added or deleted as the design process evolves. It can and should be priced out separately so that it can be included into the budget, or not, if it does not bring enough value for the cost. Q: How big of a pump should I have on my filter system? A: Only as big as needed and NO BIGGER. There is no such thing as “bigger is better” when it comes to pool pumps. With variable speed pumps, owners can maximize efficiency and get the power (for spa jets, water features, cleaning systems etc.) they need for special circumstances. When the pool is filtering, we actually want the lowest horse power possible so that we have the greatest efficiency. We do NOT want the filter pump running at high speeds or high horsepower. Q: Do I have to put tile on the pool at the water line? A: No… but yes. There are some interior finishes that can be “up-and-out” of the pool water, like Pebble Tec. However, it is our recommendation that some sort of “serviceable” material be utilized at the water line so that down the road it can be cleaned or repaired should the need arise, without there being a “patched” material (like the pebble product). Every pool, every material, needs some servicing over the years. It is our opinion that frost resistant tile is the best way to address all the concerns associated with scum lines and service. Q: Why is there tile at the water line? A: The two main reasons are aesthetics and service. First we add a tile border to add to the overall look of the pool. It should complement the other aesthetic features but does not need to “match”. It can be chosen so as to blend in with the pool’s interior finish as well. Secondly, it assists with the “bathtub” ring that can occur during the swim season with the bather waste (sun screens, body oils, etc.). By having a frost resistant tile at the water line, the area can be cleaned properly. Other type pools will put a “patterned” finish there so as to hide the bathtub ring. We offer a tile that will also do that but it can be cleaned as time goes on. Q: How many styles of pool tile can I choose from? A: There are many many tiles available for the pool waterline. Recent trends include “natural” colors but there is still a demand for a blue tile. We offer many options at no additional cost and then we can obtain custom tiles as well. Q: What materials can we use for the pool coping? A: Pretty much anything that can be cemented down can be used. However, one needs to be cognizant of things like moisture absorption, chemical resistance and comfort. We start all pool designs with the “standard” off-white pre-cast concrete pool coping and then discuss options like Bullnosed Concrete Pavers or types of natural stone like Bluestone and Granite. The pool coping needs to look good, stand up over time and adhere properly. Q: How do I reduce the amount of chemicals in my pool? A: By utilizing technology like Ozone generators, Ultra Violet (UV) Sanitizers, variable speed pumps and large capacity filters, pool owners can reduce some of the sanitizing and oxidizing chemical usages (like chlorine). Q: Does a dark interior finished pool (gray plaster, a dark Pebble Tec for example) stay warmer? A: Not enough to make that a significant selling point. Choose the interior finish based upon how you want the pool and the water to look, NOT because the darker interior may stay warmer without heating the pool. Q: What’s the best heater if I want to maintain a constant “warm” temperature in the pool? A: For those clients who are going to keep the pool at a desired temperature all year, a heat pump is the best way to heat. There is no such thing as inexpensive heat but the heat pump will do the job most efficiently. It can literally pay for itself depending upon the owners’ temperature “demands”. Asking a gas heater to perform in this same way, especially the standard efficiency heaters, is far more expensive. Q: Can I heat the pool with the same heater I use to heat the spa? A: Absolutely. Most people heat this way, utilizing the high BTU’s to heat the spa FAST (spa usage is usually “on demand”). It is also a good way to heat the pool periodically. Q: Why would I want a Heat Pump versus a fuel fired (gas) heater? A: Heat pumps are super-efficient and when sized properly, and used regularly, they can literally pay for themselves. When there is a pool/spa combo we believe a gas fired heater is essential for the rapid heat rise (speed to heat up the spa). When there is a “pool only” and one is going to want to heat the pool regularly, a heat pump is the logical alternative. Heat pumps work slowly and efficiently. They are a “set-it-and-forget-it” way of heating the pool. Q: What heater do I use when the heater is installed “indoors”? A: When the heater is installed indoors, it is most likely cost effective and logical to use the more expensive High Efficiency heaters. An indoor heater needs air for combustion and some way to discharge the exhaust. Those mechanical requirements can become costly with a standard heater, but the costs are very significantly reduced when the high efficiency heaters are used. Those heaters allow for direct plumbing for combustion air and exhaust, utilizing a much less expensive installation method and material. Q: How efficient are the pool heaters? A: There are many models and efficiency ratings vary from 83% to 95%. The more expensive units are also the more efficient ones. Most pools and pool/spa combos use the 83% efficient models. They are intended for outdoor installation and supply our customers with years of trouble free service. Q: Are the motors on the single speed pumps the same as the motors on the variable speed pumps? A: No. The variable speed pumps we offer have a better motor. So, you are saving money in two ways. First by adjusting the flow to use only enough energy to “do the job” but secondly, by having a much more energy efficient motor. They are totally enclosed, fan cooled permanent magnet brushless motors that are cooler and quieter. Q: How does a variable speed pump work? A: As compared to a “standard” single-speed pump, the variable speed pumps have adjustable flow rates to maximize efficiency. Rather than running the pump “all day” at a “high horse power”, one adjusts the flow on the variable speed pump to ONLY meet the needs of the pool. For example, one may run the pump on a higher speed for a few hours to get more cleaning action through the in-floor cleaning system, then lower the speed VERY significantly for the rest of the day to only filter the water at a very low pressure. Pumps may now run for more hours but at such a reduces horse power or speed that the savings are significant. Q: How much will I spend a year on electricity? A: It is difficult to answer this as, like with chemicals, it all depends upon many variables like length of season, weather, etc. Today’s variable speed pumps are much more energy efficient than those in the past. With a variable speed pump on an average sized pool you can budget for approximately $25.00 per month or less depending upon how one utilizes the features of the variable speed pumps. Q: Is there really any difference between the “name brand” chemicals and those available at discount stores? A: Absolutely. Not all chemicals are the same and not all chlorine is the same. There are some excellent products on the market that are not “expensive” but dissolve quickly, perform as required, do not add contaminants, and are “fresh”. Quite often the very inexpensive products one sees are also “cheap” or old. Be aware that sometimes you do get what you pay for. We have seen it countless times where clients come to us (phone or in our store) with “unsolvable problems” that are associated with poor quality chemicals they used. So, it may seem like a bargain but it may cost you more in the long run. Q: How much will I spend on chemicals per year? A: It’s all dependent upon how long the pool is opened, how warm the pool is, how warm the summer is, plus many other variables. However, if one budgets between $300 & $500 per year, that would be a fair number. Q: How often do I have to vacuum my pool? A: Well that’s entirely up to you. Most debris in a pool is wind driven and if the skimmers are working properly, then we can usually get most debris off the surface of the pool water before it gets water-logged (becomes “dirt”) and falls to the floor. However we all know that’s not always possible so cleaning the pool will eventually be something one needs to do. Also, note that decomposing leaves, sticks, bugs use up available sanitizers (chlorine for example), so if we keep the pool clean we will use less of those chemicals. Q: How much work is it to own a pool? A: Not a lot. And SURLEY not as much as “in the old days”. A lot has changed in the last decade or so, in terms of automation, hydraulics, and options. We are firm believers in the in-floor cleaning systems (never vacuum your pool – YES, that is the truth) which saves a lot of time. Also, pipe sizes have increased, pumps are variable speed and much more energy efficient, filters are significantly larger, and there is easy access to great information (ever heard of the internet?). In the old days, people seemed to be getting “green pools” often, were “dumping shock into the pool all the time”, and “fought to keep the pool clean”. Those days are GONE! If you have to spend more than 15 minutes per week on the pool (not counting vacuuming time – that’s up to you and how clean you want the pool) then something is not right. If a pool is designed properly and has the right sized pipes and equipment, there is not a whole lot of work. Q: Is it difficult to winterize an in-floor cleaning system? A: Not when one has the proper tools and experience. We winterize hundreds of pools each year with in-floor cleaning systems. For our trained and knowledgeable staff it is almost second nature. However, if a pool owner, or untrained pool “professional” tries to do this without knowing how, there can be major issues in the spring. Q: Is it easy to “close” my pool? A: No, but some pool owners that own the required equipment do in fact close their pools themselves. It is a matter of having the proper equipment (blowers, compressors & misc. tools), proper KNOW-HOW, and time. If one makes a mistake “opening” a pool it is usually a simple repair by a knowledgeable technician. If one makes a mistake winterizing a pool, it can be a very significant problem if it is due to not getting the water out of the lines (underground plumbing, heaters, pumps) and can be costly. Most of our customers hire pool professionals (our service department is here to help) to perform this very important service. It is not something one should do without being very well prepared. Q: Is it easy to “Open” my pool? A: We wouldn’t say “easy” but it is not impossible. The pool opening is more of re-assembling the equipment (one needs know how and possess the proper tools), cleaning the cover (can be time consuming and dirty), testing the equipment (more “know-how”), repairing anything that could have been damaged over the winter, and cleaning up the fall debris (debris in the water, cleaning filters, etc.). Many clients perform this service themselves if they have time. Many hire the pros. Q: Do service technicians have to be licensed in Connecticut? A: Yes! Many years ago the state, with the assistance from the Connecticut chapter of the APSP (called CONSPA) create legislation to make service technicians a licensed trade, similar to plumbers and electricians. There are two types of licenses: SP-1 and SP-2. If your pool company is not licensed, they may be breaking the law (depending upon the scope of the repairs). Note also that if you hire an unlicensed service company, there may be consequences with insurance if anything unfortunate should occur. Q: What considerations are used when designing a vanishing edge or infinity pool? A: It ALL starts with what effect the owner is looking for? Is this to be viewed primarily from the upper side of the pool, looking at the overflow as the water “disappears” over the edge? Does the “downhill” view have as great significance? Is a “waterfall” effect, on the downhill side, required? Will the effect be viewed from any upper level rooms? These questions, and others, MUST be answered prior to designing, pricing or building the vanishing edge. In many situations, the only effect required is the overflow effect for people viewing the pool at patio level. In these cases the hydraulic design is much simpler and the material selection for the downhill side less significant. But all of it matters! We need to know what the buyer is expecting as it is not something that can easily be changed later. Q: How does a vanishing edge, or infinity pool, work? A: A portion of the pool wall near the top or at the coping level (an absolutely level portion) has been removed and the pool fills up to that level and overflows. There is a catch basin on the other side where the overflow water collects. Using properly sized pumps and hydraulic design, the water is pumped from this catch basin, back to the pool which causes the overflow to continue the cycle. The “feed” of water to the pool can be another water feature (a natural looking stone waterfall, a “sheer” water feature), or something invisible from under the water surface. Q: Is the vanishing edge, or infinity pool, feature expensive? A: Expensive is a relative word so that is almost as hard to answer as asking if a pool is “expensive”. A vanishing edge (where water “falls” over the edge of the pool creating a visual effect of “vanishing” water) is a completely independent hydraulic feature that requires a separate pool structure (the catch basin) and plumbing system (another pump and filter which is sometimes a “large” pump). There is a fair amount of material and labor required to create the system and of course, it requires a level of expertise that is not easy to master. So in terms of water “features”, yes it is an expensive one. But depending upon the budget of the client, it is sometimes an integral part of the project. Q: Can I add a waterfall to the pool? A: Yes, we add waterfalls regularly. Start with the design of the pool (size and shape to fit you, the site and the budget). Then add a waterfall as an “a la carte” item. The design of the pool does not change. Just the “water feature” as a stand-alone item. Many people like the “idea” of the waterfall (the sound of water, aesthetics) but due to budget constraints, or desire for more time-saving features (like in-floor cleaning systems) add those instead. Q: How do I adjust the spa temperatures? A: One can use the iAqualink feature on any web enabled device or, if purchased, use a waterproof spa-side switch like the Jandy Spalink or Spa Switch. Q: Can I really control my pool or spa from my phone? A: Yes, you can control your pool or spa from your smartphone. Many of our customers have an automation system called a Jandy iAqualink. From any web-enabled device, one can turn on the spa, lights or any other features including landscape lights. For example, when leaving a restaurant (or theater, etc. ), activate the spa features and lights so upon arrival at home it is “ready to go”, exactly as you want it upon arrival! Q: Do we have choices on tile and coping selections? A: Yes! There are many options available so speak with a qualified pool designer. There is whole lot more than “Blue tile” and bullnose coping! Many of the products you can see on our web site. A: Yes. Our staff will handle this for you or work with you to obtain the permit in the most time sensitive manner possible. Q: What area do you travel to, to build and service pool? A: We cover all Southern New England including Connecticut, Rhode Island, and Massachusetts as well as parts of eastern New York. Q: Do I need a landscape architect? A: No. We do have clients who choose to hire landscape architects but it is not required. Based upon the scope of the project or the site conditions, one can quite often utilize the design services we offer, along with the recommendations of the landscape company. One can also hire a landscape designer (sometimes offered by the landscape company). Q: What kinds of interior finishes can I have with a gunite pool? A: There are many. The basic and most common is called a plaster finish (also known as marcite or marbelite). One can get this in varying colors like white, shades of gray or black. Other types we commonly install are Diamondbrite and Pebble Tec. Q: What does a payment schedule look like? A: The standard payment schedule is based upon getting the pool built as quickly as possible, avoiding delays associated with “waiting for payments”. A deposit of 10% allows us to begin the permitting process and start obtaining materials. There is a payment at the time of excavation, another one when the pool is gunited (or formed) and then upon adding of water to the pool. If the construction process is what we call a “Fall/Spring” project (excavate and gunite in the fall, finish the pool in the spring) then there is an additional March 1st payment. Q: Do pool companies all have standard warranties or will they vary by company? A: They vary. As in any industry, not all companies stand behind their products and services with the same level of commitment. Aqua Pool is one of the only companies to be able to say honestly that we have been in CONTINUOUS operation for SINCE 1970. How does one do that? By supplying our clients with a quality product and by standing behind what we do with one of the best warranties and staff possible. Q: Do I need to hire an electrician to do the pool wiring? A: Yes. Speak with a qualified pool designer to make sure you are dealing with an electrician who understands the specific requirements associated with a pool. There are companies we work with which will do the work for a very fair price and are very familiar with all the intricacies associated with a pool project. Q: Does the pool company need to be licensed? A: Yes, for construction AND for service. Q: Can I have my pool company who builds the pool, do weekly vacuum service open and close it? A: Yes, if you choose Aqua Pool! We have a fully staffed and highly trained service department which offers customized service packages. Some request weekly maintenance, others every other week as well as once a month or even the occasional “vacation babysitting”. Our service department has the most State of CT licensed service technicians (SP-1 & SP-2) of any pool company in CT.
Q: What’s the best time to start a pool project? A: When you are ready. We do not have seasonal sales nor create false buying advantages to increase our work load. Spring can be the more difficult time of year to build due to spring snow melts, late snow storms, and “April showers”, but it is our firm belief that no one should rush through the process to get the pool for any one given season. Building a pool is a whole lot more than digging a hole and filling it with water so take your time. Choose the right builder. Research the features and their benefits and plan on the pool supplying your family and friends with years of enjoyment. Those who rush because, “Summer is coming”, tend to make decisions that are not always best for the long run. Q: Would adding a spa increase my pool season? A: YES! We find that an attached spa will increase usage of BOTH the pool AND the spa by as much as 500%. People go from spa to pool and back and forth. They use the spa on the “less than perfect” days, maybe getting warm enough to enter the pool then go back to the spa when body temperatures lower. Our clients will open the pool early in the season, keep it open late in the fall, and use both more BECAUSE they are attached. Q: Can I bring in my own landscaper to install the patio around the pool? A: Absolutely. Aqua Pool works with some of the most highly qualified landscape companies whom we can recommend but we are always willing to meet new contractors with whom the homeowner has worked in the past. In fact, most of our recommended contractors were introduced to us by a new pool customer. Q: Do freeform pools cost more than traditional rectangle pools? A: With a gunite pool, the costs are not associated with shape but more so with the cost of materials required to build the pool. The area of the pool, as well as the perimeter, give us information which allow us to calculate costs. Shape is not a factor by itself. Quite often, a freeform shaped pool, with the same overall dimensions as a rectangular pool, will be less expensive. For example, if you draw a 20’ x 40’ rectangular pool on a piece of paper, then draw a kidney shaped pool with the same 20’ width and 40’ length inside of that rectangle, you can see that the freeform shaped kidney pool will use less materials. If the features on both of those pools are the same, the cost of the freeform would be less. Q: Do I need a fence if I install an automatic safety cover? A: Yes. An auto cover is one of the many “layers of protection” that also has many other benefits (like heat retention, assisting with keeping the pool clean) but it does not eliminate the need for a fence. Q: Do I need a fence? A: Yes! All pools must be fenced in. The home can be part of the barrier but then doors that lead to the pool area may need to be alarmed or self-closing/latching. Q: What are the advantages to a shallow pool, or play pool? A: When there is no “deep” end, there is more “usable” space; the entire pool can be shallow and there for all of it can be utilized at all times. Of course, then there is no diving and for some people that is desired or requested. It is easy to tell users or guests that “no diving is allowed – anywhere”. Having the whole pool “shallow” will allow the users to maximize the play area. So, a smaller pool can still have a very large play area when the entire pool is shallow. Q: What are the depth requirements for a diving pool? A: Codes require a minimum depth of 7 ½ feet of water. Aqua Pool feels that 8 feet of water depth is better so we always use that as our minimum. There are also width and slope requirements so speak with a qualified pool designer. Q: What are the advantages of installing an in-floor cleaning system instead of just the traditional wall returns? Q: What is the longevity of a gunite pool versus a liner or fiberglass pool? A: A gunite pool last the longest and will be the easiest to take care of over time. Liner pools are susceptible to “floating and liner tears. Fiberglass pools have gel coat issues (fading, delaminating). They are also very susceptible to floating as well (a newly formed APSP Fiberglass Council is weighing in on the issue by developing a standardized detail using a sump or drainage "crock" — a piece of 12-inch pipe that's installed vertically on the side of the pool that extends down two feet below the deepest point of the pool). A well-built and well-designed gunite pool, when serviced properly, will have the least number of issues and give the most years of worry free ownership, of any type pool. Q: What are the differences and advantages of a gunite pool over a liner or fiberglass pool? A: Fiberglass have limited designs and limited sizes. The most permanent pool you can build, the most structurally sound is a gunite pool. From an engineering perspective, there is no better pool than a gunite/shotcrete pool and it will be the least expensive pool to own over time. Gunite pools are also always customized. Even something as “simple” as a kidney or a rectangle is customized in terms of items like stairs (where, how many, how large), swim outs, depths, light locations – everything. And there is no charge for custom designs; if you can draw it we can build it. A fiberglass pool must be small enough to be transferable by a truck and lifted into the backyard with a crane (or similar). And do not be fooled by all you read on the internet. Gunite pools DO NOT need to be drained regularly. Any water chemistry issues associated with ANY pool will affect gunite, fiberglass or liner pools. 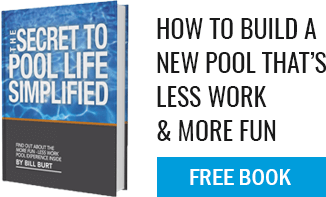 For the most years of trouble free ownership, there is no choice but to have a gunite pool. If one looks at all hotel, campground or any other type of commercial pool, pools that are built to last over time and give a “return on investment”, they are almost always gunite. With fiberglass, non-level pools are VERY common. If that’s OK, then don’t worry about it. But the base must be PERFECT before the crane lowers this pool in. It will sit nicely without the weight of the water but once you add the water (water is HEAVY) it may settle in an uneven fashion. This is a huge concern. The fiberglass can blister. Dark spots will occur. Manufacturers state that they have “pretty much eliminated that issue”. But not completely. Maintenance is NOT trouble free as some say. One still needs to “follow our guidelines” according to the largest manufacturer. So, water testing, water balance, and all the “stuff” that we educate a customer about still applies with fiberglass pools. The fiberglass benefit of “impervious” to algae (not true) and chemicals (not true) require that it is slick and slippery. Like a liner pool. Q: What is the process for figuring out what water features and elements should be included in our pool? A: Many features are purely aesthetic but there are times where even the acoustics come into play (blocking out street noise, etc.). And prices vary significantly so start with cost estimates and then prioritize what is most important for you. Some water features can be added after construction. Many cannot. If the pool design includes a raised wall and/or raised spa, features built into that raised area are often incorporated into the pool in those areas. Q: How do we figure out the best place to locate the pool on our property? A: To determine the best place to locate a pool on your property, we first determine the “usable space” (from the town supplied “As Built Plot Plan”), the pool designers look at the orientation in relation to the sun, shade, and view from the home. In some cases, the owners want the pool to be in the view from the kitchen, in other cases that is not possible or desired. It is all part of the process of working with a knowledgeable and dedicated pool designer. Q: How do we arrive at a pool shape and design? A: Our design team guides the clients through this process. Of course it all starts with how the owners want the yard to look upon completion (Do you prefer natural shapes? Geometric? Do you want an auto-cover?). You will look at the pool significantly more than you will ever be “IN” the pool so it all starts there. Once we know what the goals are in terms of aesthetics, we design the pool around the clients’ desires, budget and how they want the pool to function. Q: Is Ozone safe for swimmers? A: Though ozone is a powerful oxidizer, once it is dissolved into the pool water it reacts very quickly returning back into oxygen and leaving the water clear and safe for swimmers. A: Ozone is up to 50 times more powerful at killing bacteria and viruses than traditional pool chemicals and up to 3000 times faster. Ozone is faster than chlorine at killing bacteria because chlorine needs to diffuse through the cell wall and disrupt the bacteria’s metabolism. Ozone, however ruptures the cell wall from the outside causing the cell’s contents to fall apart. This process is known as “cellular lyses”. This process takes place in about 2 seconds. With ozone, after the destruction of the cell all that is left are carbon dioxide, cell debris and water. Once this process is complete ozone reverts back to oxygen O2; which makes ClearO3 a very eco-friendly product. This additional oxygen in the water makes it smell good and gives it a sparkle. There are no toxic or hazardous by-product. Q: What’s Ozone and why would I want it? A: Ozone is active oxygen, O3. Ozone occurs naturally in the earth’s atmosphere to protect us from the sun’s harmful rays. As single oxygen atoms are very unstable, they travel around in pairs which are written scientifically as O2. Ozone is made up of three oxygen atoms written as O3. When activated, it is called Triatomic Oxygen. This unstable for of oxygen creates oxidation when it goes back to its more stable form of O2. Oxidation is “shocking” the pool but not with chlorine (we regularly shock pools as part of our regular maintenance). By having an ozone system on a pool, one will use less chemicals, less chlorine and have pool water that looks, feels and smells better. Pool owners who are concerned about the harmful effects of chlorine will be interested in reducing chlorine levels in the water. Olympic pools are generally ozonated. Q: Can gunite pools be salt-water pools? A: A “salt water pool” is still a chlorine pool. By using electrolysis, the salt is turned into chlorine. People who have this type of sanitizer on their pools appreciate the convenience of not handling the chlorine and the smooth feel of the water. But it is still a chlorine pool and all the other chemical testing and additions are still required. Q: Is your staff trained? A: Absolutely. We spend a tremendous amount of time (and money) insuring that the people we send out on the road each day, into the back yards of our clients, are the most highly trained and qualified staff in our industry. Q: How big is your company? A: We are a large pool builder but still a “small company”. We have as many as 45+ employees between our construction and service divisions. We are large enough to be able to service our clients in the manner which they expect (we have the firepower!) but small enough to still supply exceptional personal attention. Q: Do you do all the work or do you sub-contract it out? A: We do most of the work in-house, subcontracting out only the gunite, interior finishes and sometimes the tile/coping. But our staff is always on site with the subs and we monitor their quality controls just as if they were in house staff. Our warranties are still the best in the industry – we just use a few specialty subs in an effort to supply our clients with the best possible products at a fair price. A: Since 1970. Uninterrupted by the way which NONE of our competition can match (and remain honest). In the company’s first year of existence, Ron Giannamore bought a pool from Aqua Pool. He then became a pool designer, then a partner then sole proprietor. Ron still owns some of the company with his son, Michael. We have never gone out of business or changed our name. That is not an easy feat! Q: Is the in-home design consultation free? A: YES! Call or email and we will have a pool designer contact you to arrange a convenient time to meet (including nights and weekends). Q: How much does an inground gunite pool cost? A: It’s nearly impossible to answer this question, especially without knowing the features and options desired. It is similar to saying how much is a car? Or a home? It depends upon the pool you design (with the aid of one of our highly trained and knowledgeable staff) and the features added. All our gunite pools are built with the same strict quality control standards, but the size, material selections and features change the price. We start the pricing in the “low 30’s”. After that it all depends on the design and features. A: Yes. A Christmas Decor representative will work with you to schedule a takedown appointment that is convenient for you. A: Absolutely! Our decor is manufactured to our specifications—longer-life bulbs and extra fullness on all of our greenery. We also feature UL-rated, outdoor extension cords, a variety of property-friendly installation accessories and commercial-grade specialty décor. You won’t find better quality anywhere! A: With Christmas Decor’s Service One program, maintenance is included in the price. We will also conduct proactive service visits throughout the holiday season to make sure your program looks like it did the day we installed it. A: The new Christmas Decor program is all-inclusive—one price for everything. A: All decor is included in the service package. With Christmas Decor’s Service One program, you’ll never own old, worn-out decor again! With our program, decor is automatically replaced when it needs to be – and you will have the flexibility to change colors upon renewal! Q: DOES CHRISTMAS DECOR CARRY LIABILITY INSURANCE SPECIFICALLY DESIGNED FOR CHRISTMAS DECORATING? A: Christmas Decor franchises are trained, insured professionals. A: We currently serve more than 40,000 customers in 48 states and Canada. A: Christmas Decor has been decorating since 1986, and franchising since 1996.